Need a little pick me up this Monday? 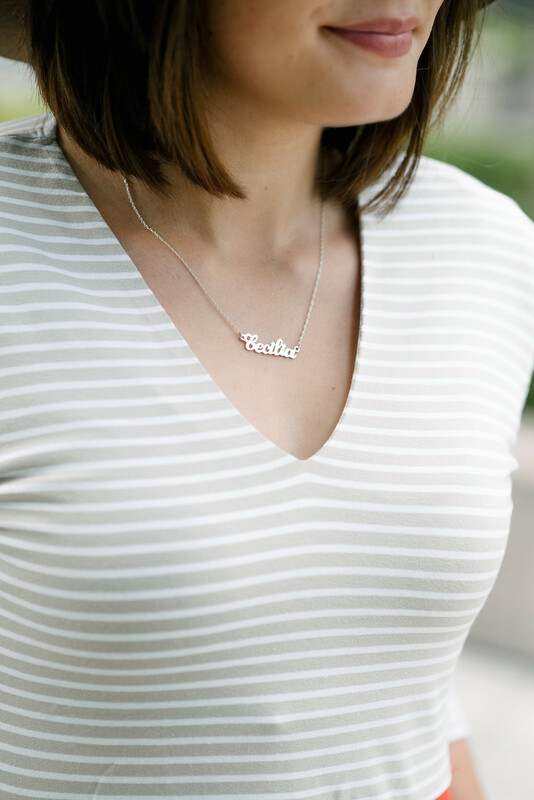 Today I have teamed up with Jane Basch to giveaway a script nameplate necklace (a $437.50 value) to one lucky Dearest Lou reader! I mentioned in my previous blog post that I have always wanted a piece of jewelry with my name on it. This little number from Jane Basch is perfectly classy and chic and completes any look I put together. I chose white gold so it would go perfectly with my wedding ring set. There's also a yellow gold and rose gold option that are both oh-so lovely. Jane Basch is my go-to store when it comes to minimalistic jewelry. I own several of their pieces and wear them on a daily basis. To enter, simply visit Jane Basch and let me know which gold option & name you would put on your necklace if you won. Remember to fill out the rafflecopter widget below, the more entries you complete the better chance you have of winning. Giveaway is open to all Dearest Lou readers now thru September 21 at 11:59PM EST. If international reader is randomly selected, they will need to pay for shipping to their country. Social media accounts must be set to PUBLIC on September 22, 2015 from 12AM EST- 3AM EST since I will be verifying entries at that time. Winners will be announced here on September 22 and contacted via email that same day. Thanks friends and good luck. I am definitely a yellow gold kinda girl and I'd probably get my own name on it! I would go with white gold and get my last name, Harris, on it! I'd go with the white gold option and have my daughter's name, Lily. I love the yellow gold and I would put my name! I love these necklaces, they are so so beautiful! They are small, yet they make quite a statement! I'd choose rose gold and @superdumb! I love the lower case petite script option, too. I would choose the 14K yellow gold option with my name, Jennifer. Great giveaway! I would go with the rose gold and have my name 'Jackie' on it. I love all of her jewelry and have been looking at getting my daughter the three initials necklace. I would get the Gold Small Script Nameplate Necklace. Thanks so much for the generous giveaway opportunity. I'd do white gold and 'aubry'. I've always wanted one! I'd get it in rose gold with my last name on it. So cool! These necklaces never go out of style. I'd get "Amber" in rose gold. Thanks for the opportunity! I would use white gold with the word July on it. Great give away and this necklace is so lovely! I would love to get my mom's name, Wanda, in rose gold. Very nice necklace. I would choose the white gold. I would pick rose gold and.... probably my daughter's name or Nickname. I am such a fan of rose gold! The name would be either mine (Rachel) or my mom's (Sherri)! Such an amazing giveaway! I would get my name, Priscilla, in rose gold. I would love to get my name in rose gold! And i'm also dying over your instagram feed. Haha. Had to add that! This is gorgeous! Crossed fingers! Nice giveaway! I'd pick the rose gold option and I'd pick the name "Monika" - fingers crossed! I'd choose the yellow gold with my name on it " Karin "
I would choose yellow gold with my name, Leah. I would choose the yellow gold with "AMPoesy" for my friend Amanda. I would love to win this giveaway. I would love the Yellow Gold with my sisters Name Shubha, as its her birthday today and want to win this giveaway for her.